Lovely fresh building with great staff that will take care of everything. Ive stayed in multiple places around mpay bay and this has the lot. Keep up the good work! Awesome guest house! I would absolutely stay here again. It’s in a great location right at the pier. The village/beach are really chill. I hated to leave the island. Great place right on the beach off of the dock. Gets the job done for the price and the staff is very nice and helpful. Best WiFi by m’pai bay. Had to leave early due to the weather and by mistake was only refunded for one night instead of two. When I emailed them they responded quickly and I had the money back the next day. Bonus cute doggy. We stayed at Bongs in July 2018. It was low season so the whole island was pretty chilled, including Bongs, which we really enjoyed. We ate breakfast there a couple of times and it was really good! Tasty, big portions, fresh. The rooms are basic, which is expected on the island, but it was nice to have our own bathroom. The staff were friendly & offered us lots of tips. 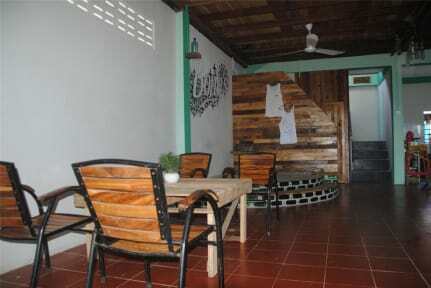 Hostel is right by the pier, easy to find and great location for exploring Koh Rong Sanloem. Bit more expensive than others. 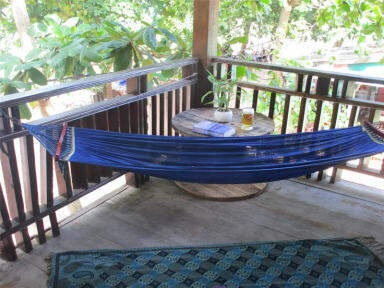 Remember: you're going to Koh Rong Sanloem because you want an off the grid island paradise, not a resort. That's exactly what you get here, and you need to embrace island life. Staff? Awesome. Facilities are basic, and you're only getting a hot shower if you time it with the sun heating the pipes. Just add some more hammocks and this place is perfect. Bongs is great, we had such fun exploring the island from there! The food is amazing in the bar, and the staff are friendly and helpful. The bed is comfy and the tiny bathrooms functional! The private room is a simple one with fan and basic bathroom, but ours was clean and without any bugs, so we liked it. The location is great and staff was super friendly, they even offered us a free breakfast and helped organize snorkeling trip. Food and bar downstairs are really good. We stayed 4 nights and would come back anytime. It’s just basic room. We booked private room and it’s very small. Barely able to stand in the bathroom, tiny bathroom I never seen in my life. There’s a corridor and space outside which was just EMPTY! And the could use that to make rooms bigger!